There were 676 press releases posted in the last 24 hours and 154,041 in the last 365 days. 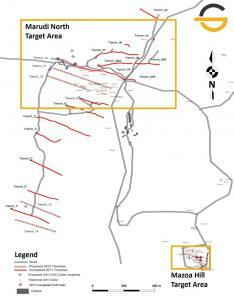 VANCOUVER, BC, CANADA, July 6, 2018 /EINPresswire.com/ -- Guyana Goldstrike Inc. (TSXV: GYA, FSE:1ZT) announced that the geological team has commenced trenching, sampling and mapping at the Toucan Ridge area on its Marudi Gold Project (“Marudi” or the “Property”) located in the Guiana Gold Belt, Guyana, South America. 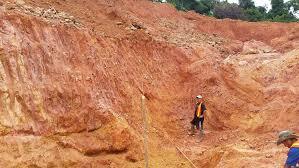 The initial area of trenching on the western end of Toucan Ridge is located 1 km east of the Marudi North Zone. Two of the current trenches (TTR-18 series) are approximately 300 m upslope to the north of Toucan Creek where historic alluvial mining has been active for many years. Toucan Ridge continues for more than 1.75 km to the east of the first trenches; sites are planned along the length of the ridge where quartzite-metachert is exposed or interpreted to occur beneath transported overburden. The eastern part of Toucan Ridge is approximately 400 m south of the Paunch area and 350 m north of alluvial workings on Toucan Creek. In May 2018, trenching samples from the Paunch area returned high-grade results of 5.98 g/t and 7.45 g/t gold. As of July 4 a total of 725 meters has been trenched in all areas of the phase one trenching program, with 203 samples having been sent for analysis. Two samples have been collected from each interval along the base of the trench walls, one for panning to examine a heavy mineral concentrate for the presence of gold, and one for geochemical analysis of gold and trace elements. Sample lengths vary; many are 3 meters in length. Located on the north slope of Toucan Ridge. Uncovered large quartzite-metachert angular fragments and boulders above saprolite derived from mafic metasediments. Quartz veinlets or quartzite with rusty / yellow / black oxidation was documented. Sited on the south slope of Toucan Ridge approximately 50 m southwest of TTR-18-5. Uncovered quartzite-metachert outcrop in two locations. The southern quartzite-metachert interval is 6 m in length; black oxide, not magnetite, not hematite was documented. 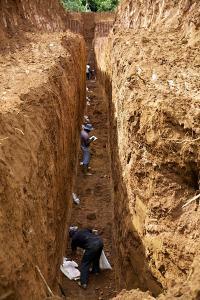 Quartzite-metachert was uncovered over a length of 79 m in the southern end of the trench. The trench will be extended. All samples collected during this program were delivered to Activation Laboratories Ltd. (Actlabs) located in Georgetown, Guyana for gold content by Fire Assay (FA). Actlabs is ISO 17025 accredited and/or certified to 9001: 2008. With 25+ years' experience, with full analytical laboratories that perform high quality analysis to many industries around the world. Actlabs is an ISO 9001:2008 qualified assayer that performs and makes available internal assaying controls. Certified blanks and standards are systematically used as part of Guyana Goldstrike's QA/QC program with one blank and standard inserted at every 20 sample intervals. https://en.wikipedia.org/wiki/Homestake_Mine_(South_Dakota) and was in production from 1878-2001.